The plants arrived a few days earlier than expected so there was quite a rush to get them put in. However we had to wait for the trellising to be finished! 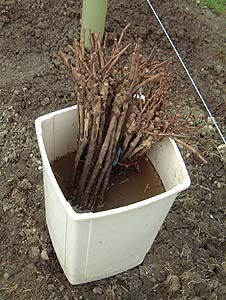 The vines arrived in bundles of 25, bare rooted and in a large plastic bag. They were fairly wet but it was obvious that they would soon dry out unless we got our act together! Shown below are the "Plant Passports" that were provided with the vines to shown their origin and pedigree. 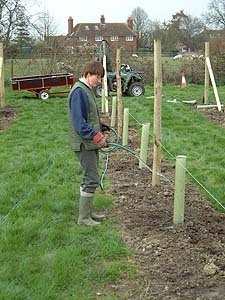 As instructed by Mr. Cox (what would we do without it) we soaked the vines for a few hours before planting. Basically planting was down to Ali and I, although the kids gave a hand where they could, particularly with filling in the pre-dug holes and watering. Andy knocks it in a few inches with the back of the spade and ties it to the wire. I think we both felt we had the better job so it worked out well. We planted seven rows the first day, six the next and finished the odd ones over the next couple of evenings. The long days were followed by long soaks in the bath to repair worn out backs! Anyway I hope we won't be doing that again, at least not on the same scale, for quite some while! However at the end of it we had the satisfaction of having everything ready to sit back and watch them grow. The result is shown below.